Does anyone know of any studies about the effect of chronically elevated CO2 levels (per se) on breathing organisms such as myself? I’ve seen investigations on how the pores of plants are affected, and of acute, short-term exposures. But as to the biological effects of never drawing a breath of air with less than 300 ppm of CO2, I’m surprised that few have thought of looking into it. Here is a real-life study on airplanes, where CO2 levels are typically between 600 and 1500 ppm. It also contains references for other CO2 studies. Thanks for letting us know about what sounds like avery valuable resource! At any rate, sorry about this rant, but it’s really important that New Zealand suffer some real economic consequences for its failure to live up to its carefully cultivated image, and that if you are buying products from New Zealand, you are supporting a country that is no better than yours. Tell your friends. If New Zealand were to change, I will tell you. In regard to this particular topic, then, I am a local medical practitioner, and over the last few years, myself and some of my medically qualified colleagues and other people with the professional qualification of “Dr” have so signed their letters to our local (climate denialist) newspaper, the Dominion Post. But we have come under fire from other correspondents for doing this, what right does our medical qualification give us, they complain, to suggest expertise in climate science or in any other matter other than pertaining directly to medicine. This caused one of our number, Dr Scott Metcalfe, to send this letter, signed by several of us. Rex Benson (Letters, May 6) misunderstands modem medical practice, which is much more than prescribing pills for individuals. Health professionals – including doctors – have a professional duty to act and press for their patients and populations, current and future, including scientifically established risks to public health. Every day we see the harm of inaction. The NZ Medical Association’s landmark statement on health equity on 4 March (on the NZMA website) clearly mandates doctors to talk about what determines health. The longstanding ethic to ‘First do no harm’ extends to speaking out against policies and practices that harm – whether by damaging child health, widening health gaps, or escalating climate risk. The world’s health authorities are focused on dangerous, costly and potentially irreversible climate change as the biggest health threat this century. Good medicine recognises risk and urgency and sometimes must act presumptively on emerging but incomplete information. So despite some uncertainties (inevitable with any science), the potential consequences are so calamitous and imminent that the responsible action must be to rapidly reduce greenhouse gas emissions. PS Re my posting about New Zealand. 2) New Zealand does do many environmental things very well, and it’s not that NZ is manifestly worse than many other countries, it’s just that it’s manifestly no better. This attempt to increase the perceived value of our goods and services, in our competition with other nations, by claiming that it is better, is either unintentionally hypocritical or intentionally misleading. While I think this book is a good idea, it seems like there would have been a better market for it 5 to 10 years ago. The general public is tiring of the “Dangers of Climate Change” scenarios these days and turning a deaf ear. I think the article’s authors said it right when they described it as a book “..which many others really should [read]”. The question is, will they? I had the privilege of driving a professor of medicine from Houston a couple of weeks ago. He was in town to deliver the keynote address at the Primary Care Update conference. His topic was Tropical Diseases You Need to Know About, Now. 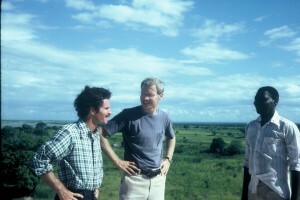 On our trips he outlined the problems as he saw them: increasing malaria across the Southern US, expansion of the dengue fever range into Southeast US, increase in cases of encephalitis and return of yellow fever in the west, increase in plague that is completely resistant to treatment (found in Madagascar) and so forth. Lovely, but he had a good attitude. Thanks for mentioning allergy and asthma problems. I don’t happen to be allergic to ragweed, but less winter means more pollen in general. Thanks for mentioning “Soybean rust” and insects which are additional reasons for going hungry, but droughts and floods may do us in first. The book seems to me to be soft-pedaling GW. The problems mentioned are trivial compared to a world wide drought that shuts down agriculture in the middle of this century. Such a drought that ends civilization has been discussed before in RC. “Non-linear”ities are the thing that bites most people. They don’t understand the concept because it is mathematical. A tiny change now is not noticeable, so they dismiss the whole issue of GW. But the tiny change is the precursor of something cataclysmic. The “unequal suffering that will be experienced due to inequalities in wealth” may not work out the way you expect. Since money is worthless once civilization collapses, the formerly rich are in for a rude awakening. The most likely to survive may be those who are still living in the stone age. The collapse of money will have no effect on stone age people. If they are not over-run by outsiders looking for food, they may continue as they were until some of them migrate out much later. Thank you for the review. Sounds like an important and timely book. It constantly surprises me how infrequently the word ‘health’ appears in mainstream media and blog discussions around climate change. For better or worse, people in the real world generally don’t care about complicated abstractions like CO2 ppm, temperature anomalies, attribution of extreme weather events, and ecosystem degradation. They do care about the physical and mental health of themselves and their families. The time when climate change gets widespread recognition as a public health issue is the time when we’ll see serious political moves to mitigate and adapt to the problem. Did the professor mention what he felt was the cause of these recent increases? It has been reported by the CDC(at least for malaria) that the increase in infections has been due to person travelling to infected areas. Any comments? Dan, it’s not malaria, but mosquito borne disease has killed a couple of people in Australia following our summer flooding – not in Queensland but because of the flooding in Victoria and similar floods in the Pilbara region of WA. The people who got ill (including the 2 who died) didn’t go anywhere, the mosquitoes bred locally. Murray Valley encephalitis has no vaccination nor any specific treatment. The only prevention measure is insect repellent. I know very little about Murray Valley encephalitis except for what I just read in an NSW government report, which said it was confined to NW Australia except during times of heavy rainfall and flooding when it spreads east and south. That sounds like what has happened this year. Do you concur? Are there signs of a possible epidemic? With all due respect, I am inclined to push back on that assertion. I suppose it depends what you mean by “global drought”. If you mean “every square inch of the Earth’s land surface is experiencing drought”, perhaps you are right. But if “global drought” means increasing frequency and duration of intense drought conditions and/or steadily increasing chronic aridity in the American southwest, Australia, Russia, China, Africa and South America, all occurring at the same time, and significantly reducing the productivity of some of the world’s most important agricultural regions, then I would say the evidence for that is that we are already seeing it happen, now. Without speculating wildly about the end of civilization, one question has occurred to me: if we eventually have to downshift to a somewhat less high-tech, long-supply-line mode of life, how can we maximize the usefulness of the huge advances in medical knowledge, technology, and technique that we have achieved? Might it not be useful to start thinking about what a relatively resource-constrained medicine but still scientifically informed medicine might look like? Jim and Rasmus: Paul Epstein and I appreciate your thoughtful review, and are glad that you highlighted our emphasis on a synthetic, systems-based approach. I’d like to respond to the point Jim made about the effects of ecosystem changes on human health. I agree that ecosystems can change in surprising ways in response to climate change; that these are very difficult to predict, and that in certain cases, regional changes could be judged as positive. In the case of agriculture, for example, it is possible that as some northern regions warm (near the U.S.-Canadian border, for example), that crop production could rise regionally. But overall, we believe that the cumulative effects of climate change on agriculture—the increased insect damage, harm to crops from heat, loss of irrigation water from melting mountain glaciers, extreme weather and flooding (as we’re seeing in the Mississippi Valley right now), and a rise in weeds and plant diseases will lead to lower average crop yields. This of course could harm food security, or lead to malnutrition or even, in some vulnerable areas, famine. More generally, our discussion of the effects of ecosystem change on human health was anecdotal. It had to be. Knowledge of these effects is incomplete. That said, we think it’s important to combat the reductionist thinking that has led many people, including some scientists, to focus only on the risks that can be clearly documented, and not on the murkier yet potentially larger risks that arise when stressors accumulate and push ecosystems to the brink. This is why we covered health risks such as intestinal and neurological problems from red tides and how climate change in the U.S. West has contributed to forest fires, causing smoke that aggravates respiratory and heart disease. More generally, healthy ecosystems, including the managed ecosystems we call farms, help supply us with clean air to breathe, pure water to drink and nutritious food. The links are intuitive, if incompletely documented, and we ignore them at our peril. Finally, in Changing Planet, Changing Health, we also lay out a suite of technology and policy solutions to help us move to a low-carbon economy, mitigate climate change, and thereby protect human health. Many of these solutions were carefully vetted in studies that Paul and many colleagues conducted, with the goal of identifying solutions that offer maximal benefits and minimal damage to human health and to the environment. At this point, we need to choose such solutions carefully. We can no longer afford to miss the forest for the trees. Matt (#9), it surprises me as well that health is mentioned so infrequently in media coverage of climate change. It’s one reason we wrote the book. And I agree that ordinary people care about the physical and mental health of themselves and their families more than abstractions about climate change. I share your hope that when people connect climate change with their health and the health of their children and grandchildren, that it will help spur real change. But, alas, I don’t think it’s quite that simple. Since we didn’t talk much about communicating climate change in the book, as Jim and Rasmus point out, I’ll share a few of my thoughts here. (I’m speaking only for myself and not for Paul Epstein.) I think there’s no one-size-fits-all approach that will move everyone to action. Some people pay a great deal of attention to health news and information; some don’t. The ones who do can be influenced. Some care mostly about national security, and will respond more to a report by a bunch of generals and defense experts on the looming national security problem posed by climate change. Others will respond more to the threat to the forests, rivers, lakes and seas. Still others will respond only if their pastors talk about the threat to Creation. Many, many others will respond only if they stand to gain or lose money, which is why we need policies that create incentives for doing the right thing. Then there’s the question of what will move policy makers to take meaningful steps to mitigate and adapt–or even to drop the denial and recognize reality. Some are–but most of them are working at the local or regional level. In Washington, money has contaminated the system to such a degree that I think it will take a very large groundswell of public support to dislodge the big power players and push through the reforms we need. Politicians tend to move when they’re scared they’ll lose their jobs, and often not before then. About a month ago, I was on a panel at the University of Illinois discussing the solutions we recommend in Changing Planet, Changing Health. A rural sociologist on the panel noted the absence of social scientists in our book and suggested that such experts might have a lot to offer in terms of understanding how to move people to action in the real world. I agree. The communications challenge is a big one–a lot of smart people have thought about it for years–and we need every possible tool at our disposal. Dan. Epidemic? I hope not. The numbers are pretty low – half a dozen in WA, even fewer in SA and Victoria. But these were the first MVE cases for 30+ years in SA. So by comparison, it would look a bit like an epidemic on a graph. There have also been higher reports of Ross River virus and a couple of other unusual mosquito borne illnesses. But these tend to cause long term debility rather than kill you by raging infection as MVE can. The big issue for MVE is that it’s carried by birds and there’s been a welcome explosion of water birdlife in the region. So the rule here from now on looks to be – don’t just smile when you see lots of pelicans and ibis nesting by the water, get out the repellent spray. Dan, thanks for stopping by. Will the book be published in the UK? Re: human health as a driver for action on climate change, I agree it won’t work for everyone. Otherwise health promotion would be easy. Most smokers know it’s bad for their health, and that knowledge on its own isn’t enough to make them stop. But the line climate activists have been taking to date is analogous to telling smokers not to smoke because it degrades the environment- other people don’t like it, it smells bad, stains the walls etc- while neglecting the argument that it kills the smoker. The public health community does seem to be engaging with climate change as an issue, at least on this side of the pond, but the problem is that the public and politicians are not engaging with it as a health issue. Unfortunately I’m not optimistic. It will probably get widespread recognition as a serious public health problem at the same time it’s recognised as a serious national security, food security, and (possibly) immigration problem- and meaningful action will be taken, but not before avoidable adverse societal and health impacts have been incurred. I’d like to second the question posed by SqueakyRat (#14). Indeed his question can be expanded beyond medicine to most facets of a modern society. What does a sustainable society look like when it is committed to the advancement of knowledge, the best affordable medical care, the alleviation of a regional problem (like drought) with surplus from another region, etc? It’s not a bunch of self sufficient and relatively isolated communities. It still has to have cities, universities and long-distance shipping even if we try to do less long-distance shipping. Anyway, I’d be really interested if the authors of this book have a picture in their heads of what an advanced sustainable society looks like. Matt, I do think the public health approach is critically important. Many of the environmental laws we have in the states came about in large part because of concerns people had about their health. I think health is a powerful motivator for many, and we definitely want to reach them with this book. The smoking analogy is a good one in several ways. We’re dealing with an addiction — nicotine, or easy energy from oil, gas and coal — that is dangerous yet tough to beat. The wealthy industry that sells the addictive product has many politicians in its hip pocket. (This was once true about tobacco.) It has funded a public relations campaign of several decades duration to sow doubt about well-established science confirming the harm of their product. And that public relations campaign in fact includes some of the same people who used to defend cigarettes and excuse second-hand smoke. The public health community in the United States is becoming engaged in this issue, as are leaders in the medical community. It hasn’t really filtered down to the rank-and-file doctor or nurse, though. I spoke with a medical educator recently who complained that when she tried to educate first-year medical students about the health risks posed by climate change, she got little support from her colleagues or superiors. So there’s a long way to go. But there are also a lot of positive changes happening right now, which offer reasons for hope. And on publishing the book in the UK and other territories. We hope so and are working to make that happen. The last IPCC report was pretty reserved on malaria, I thought. For good reasons, or out of conservatism? Do we know more now than in 2007 about the relative importance of non-climatic factors in the observed and projected spread of malaria (vector control, migration, drug resistance, insecticide resistance, land-use and other ecological changes)? Do we have projections that take adaptive capacity better into account? I’ve thought for a long time that it would be really useful to aggregate in some place all that we know about the technologies of other eras. Instead of by some arbitrary time line, maybe by available energy sources. A life style like the 1920s with much of modern medicine, would be fantastic alternative to the Mad Max kind of dystopias that are widely imagined. Very interesting stuff – thanks for posting this review. This may be too specific of a question for here, but in recent years there have been more and more outbreaks of West Nile and forms of equine encephalitis. The first case of the year was reported earlier this week in Texas. I know these are mostly mosquito borne diseases – are they linked to shifting patterns in mosquito species distribution? Or, like with malaria in the above post, mostly owing to contact with regions where EHV-1 is endemic? It would be really good to have a well-developed idea of where we are trying to go. It’s not easy to imagine how things will need to be. But of course there are many, many pieces to the overall puzzle. John Munro (#4) has some highly relevant comments re the New Zealand “Clean and Green” image. From my perspective – 36 years in England and 38 years in New Zealand, it is the cultural discontinuity of a mostly British high-population-density immigration into a low-population density New Zealand that is the determinant of “world’s sixth highest environmental footprint”. The dilution by the environment of the so-easily disposed contaminants was once so great as to raise no significant concern. In more recent times, following 1 to 2% per annum immigration, the population has risen very noticeably – 3 million when I arrived in 1973 to over 4 million today – as has the vehicle density per capita, from generally one per family to two, and the level of indistrialisation, especially intensive pastoral mecahnisation. It is very noticeable that Japanese and some Asian tourists are exceptionally careful of their rubbish disposal – a cultural feature in Japan and Singapore. If our population and industries followed their example we would have no problem to speak of. Not that this is much relevant, but my father was diagnosed with malignant tertian malaria during the Solomons Campaign (Guadalcanal, Tulagi, Gavutu-Tanambogo, etc.) during WW2. They sprayed the base areas with copious amounts of DDT, as well as drenching their clothing and bedding in it. He still caught it. 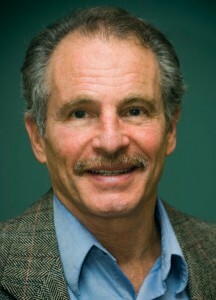 Good presentation (including Dr. Epstein) on PBS “Need to Know” tonight. It’s very interesting that diseases and pests are migrating – they used an instance of tropical fungus that appeared in the Pacific Northwest; incidents like this are becoming common. Allergens are certainly on the increase due to longer warm seasons and enhanced pollen production. (I don’t understand all the mechanics, but the facts seem to be established if you discount the fringe knee-jerk negaters.) The program tends to rerun over the weekend so you can find it on your local PBS station if you wish to view it. New Zealand has a fine potpourri of climate commentary and information which you might appreciate and might make you feel less isolated. Their weekly radio show covers a lot of bases. Susan, one of the better episodes of “Need to Know”. Worth noting they also had a piece on the coal mining disaster with a clip of the CEO of Massey Energy company waddling around a stage clad head-to-toe in a garish American flag outfit berating government regulators, saying that the idea that they care about worker safety more than Massey was as crazy as the global warming theory. A. sobering and revolting spectacle of bloated parochial arrogance. Is there a link in their book to disease vector information? I would be interested in the duration and loci of disease outbreaks. I am also searching for information on animal and insect pathology changes. Are we, as a species causing other species to adapt specifically to the environments we create? Altering their social dynamics, reproductive tendencies, lifespans etc. ‘In clear, accessible language, it also discusses topics including Climategate, cap-and-trade proposals, and the relationship between free markets and the climate crisis.’, which sounds much more ‘political economics’ than the science/health/AGW/environment book described in the post? 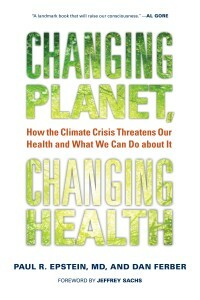 ‘Most importantly, Changing Planet, Changing Health delivers a suite of innovative solutions for shaping a healthy global economic order in the twenty-first century.’ Those two sentences describe a different book to that described overall in the post? but having browsed through his other writings from the HMS website and letters to the NYT and so on I see he has plenty of strongly held opinions in areas well outside his undoubted qualifications in environment and health. I also noticed (in the other writings) a perhaps one-sided naivety that you remark on in your review, you mention issues like the Gulf Stream, storms, Norway, African glaciers, where he tends to the black and white, which for me detracts from the level of trust I’d have when he’s writing about what he knows. Hot Rod (#33): We certainly make an argument with this book, but it’s one we believe is well-grounded in science and documented fact. As you know, not all expertise comes from academic training programs–much is learned on the job by collaborating with experts in other fields. 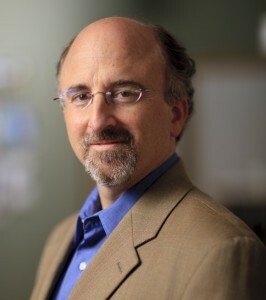 For the past decade Paul Epstein has collaborated extensively with scientists with a wide range of expertise, as well as with economists and leaders in the banking and insurance industries, to help identify practical, real-world solutions. This work includes a number of in-depth studies to vet many of the solutions we propose in this book, all of which are available for download at the Center for Health and the Global Environment website: http://chge.med.harvard.edu/publications/reports/index.html. If you’d like to dive in, I suggest the various life cycle analyses of energy sources like oil and coal, and especially the report, Healthy Solutions for a Low Carbon Economy. We draw on all this work and additional research to propose solutions that range in scale from the individual to the global. Thanks for your interest in our book. One concern I have is there seems to be little or no discussion of possible health benefits of a warmer climate. This leaves such work wide open to the attacks of the denialists. What are possible benefits? For those of us who live in high latitudes, these might include a shorter flu season, longer growing seasons, more rain in some places, and the health benefits of spending more time outdoors. To be credible, both potential negative and positive effects need discussion. And to add to it….there is the issue of warmer weather (which we would expect in a warming climate) contributing to higher violence rates. This has been studied for years, well before CC became a big topic. And some have also studied the impact of other CC effects, such as severe storms, floods & droughts on increasted violence, due to the increased psychological stress. And then there are the heat and collective violence riots) studies. There is also the issue of the increased flooding caused by CC spreading toxic and hazardous waste and chemicals around & harming health, as well. Is there an entomologist in the house? I am wondering about research on the relationships between a warming climate and insect populations (in general, but of course there are many health ramifications.) We have been experiencing a very wet spring in New England (USA) followed by a period of well-above-average heat and humidity. I have lived at my address for 12 years, and clearly notice a change in the phenology of blackflies (a major annoyance, a mental health threat!) — their peak arrives about two weeks sooner than previously, and their numbers, along with mosquitoes, June bugs, and others have been through the roof this season. Ticks are also more numerous and earlier. Do insect populations show trends with CO2 as well as temperature? Do we have a prognosis with the expected changes this century and beyond? While I do not doubt our species’ ability to survive whatever may come our way, at least in some numbers, I do wonder about the quality of life, and insects could figure heavily in that. Can’t say I’ve read the book yet (on order) but could the authors, or anyone else, comment on the 300,000 deaths/year attributed to global warming in the Human Impact Report published by the Global Humanitarian Forum in 2009? If such a figure can be supported it should be made more use of. Well, I have not read the book as yet, and sadly only came to read the article just today, but I am happy to see systems theory and Bertalanffy mentioned. He is considered the father of modern systems science. I worked with Dr. James Grier Miller from the late 80’s and throughout the 90’s who had based much of his work in Living Systems Theory (LST) on Bertalanffy. Miller was also worked in cybernetics and behavioral science (actually he coined the term). For those interested I developed a health definition of interacting systems. The version of the health definition on this page is an older version but applicable. I have further developed it and will have the new version hopefully online later this year. Dynamical system interaction has struggled somewhat with what is health. Even modern psychology has struggled with what is health? The definition applies to general system interaction as well as subsystem and parent system interaction. It applies to physical and non physical systems as well. The Lancet is speaking out about climate change vs human health. h/t Sime.